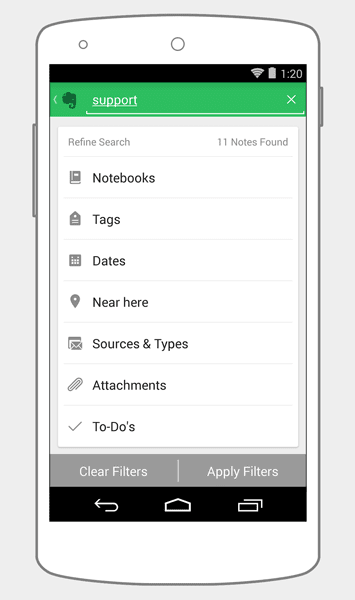 Version 6 of Note Books app Evernote available now for Android devices. Evernote for Android is one of the fastest growth. "Evernote introduces a number of new features and enhancements to its app for the Android devices to facilitate its use. Evernote 6 offers a new interface, better suited to the different screen sizes of Android devices (smartphones, phablets, Tablets, Chromebooks). It seeks to be more ergonomic, with a button "New Note" easily accessible in the bottom corner of the screen, and displayed permanently in the different sections of the app. In the Evernote Business version, it is now available alternately performance reports and personal notes. This new version of Evernote allows you to easily share Note Books with others via a dedicated button for each book. An ideal feature in business and in line with the trend of collaborative tools and BYOD.